Enjoy the fall colors as you walk around Young’s Pond and visit Bob’s Woods, which was acquired by the Branford Land Trust in 2004. Scheduled for Saturday, October 24 at 10AM, this popular Land Trust walk will be led by Truman Sherk, who is well versed on the history and botany of the property. Truman grew up in Branford, is a biologist and has been actively involved in the BLT for many years. It should be an interesting walk for both youngsters and adults! Park and meet in the large parking lot for Young’s Pond on Blackstone Avenue/Route 146. The rain date is Sunday, October 25. Please watch our website or Facebook page for schedule changes. 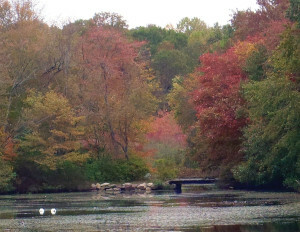 The Fall Foliage Walk is presented by the Branford Land Trust’s Nature Explorer Program, which coordinates a number of events for adults and families throughout the year. All events are free and open to the public. For all BLT walks, please wear appropriate dress and comfortable, supportive walking shoes. Bring water. Walking sticks welcome.